…annoying and ubiquitous, especially the Vatican’s ones. Today I happen to wonder about Vatican square at mid day. The air was crisp, the sun high in a blue sky, the perfect refreshing winter day for a solo stroll outdoors. Soldiers in uniforms on leave were filling the scene while the silence of the wind was broken only by the voices of groups of student tourists playing hide and seek between the columns around us. I did not feel like I was in Rome today. There were not gladiators, no lions, no emperors or blood-thirsty army to fight against Berlusconi and his Bunga Bunga vizzietto. It felt as if I were an extra off a Reinassaince movie within the Vatican’s guards dressed in their funky uniforms, the Carabinieri on horses platooning around the square and the little kids giving food off their hand to the pigeons. All we were missing were dames in their very round skirts with feathers and an extremely tight corsets. But then again, the Church’s clock bells sounded 2pm and the infinite bubble created around reality vanished. And Lybia was still decisive in pushing Geddafi aside, Egypt and Tunisia already happened, and I was me, still with a broken knee and some more limping to do before getting back to wonderland. No movie set, no dreaming about any noble ranks and fancy clothing. 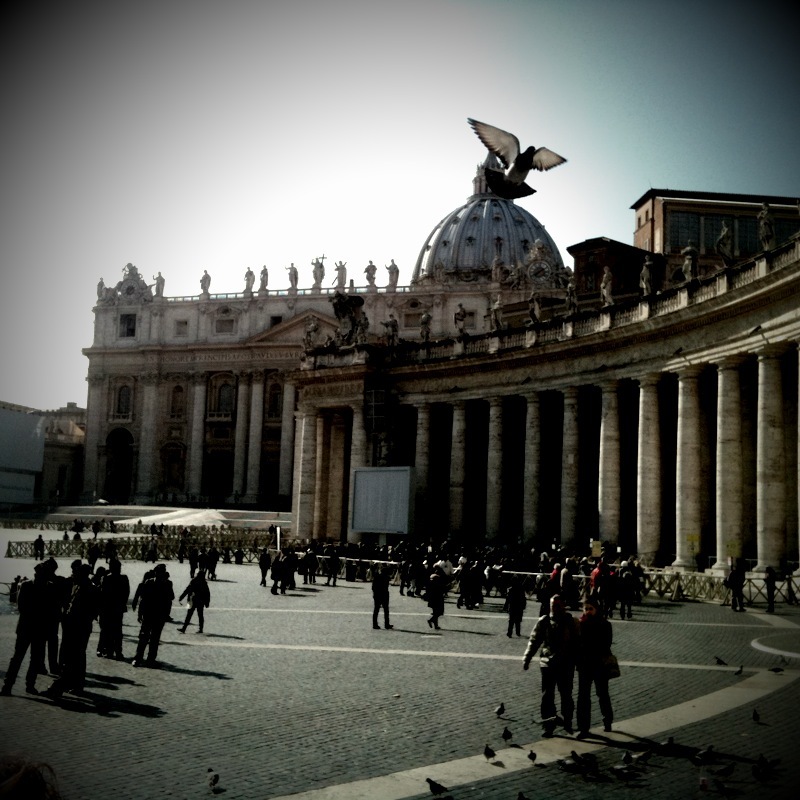 Just a sunny day in piazza San Pietro. What’s even more bizarre is how I managed to write a whole post on it based on a photo where a poor, annoying pigeon just flew on the right spot at the exact, right time.